In the last few centuries, certain Bible scholars and champions of higher criticism have devoted significant time, energy, and resources in an attempt to redefine or completely remove a "thorn in their flesh"—the biblical doctrine of inspiration. Specifically, it is has been the plenary [full/complete] verbal inspiration of the Bible that has irked and agitated the unregenerate heart to no end. However, despite the best efforts of many post-Enlightenment rationalists, there just isn't any room to breathe a different kind of air than that of Spirit of God, what He has spoken, and still call it "Christian." Besides, it's a fool's errand to try and cast off the restraints of the long-held doctrine of biblical inspiration (c.f. Ps. 2:3). For the wise, obedient, and Bible-believing child of God, the choice is clear: it's all or nothing. Throughout the history of Israel and the early years of the Church, there wasn't any talk of "partial-inspiration," nor did any copyist's error cause the persevering believer to see the Scriptures as anything less than "the Word of God." Inspiration was assumed, and obedience to every word was a non-negotiable. So what has changed? 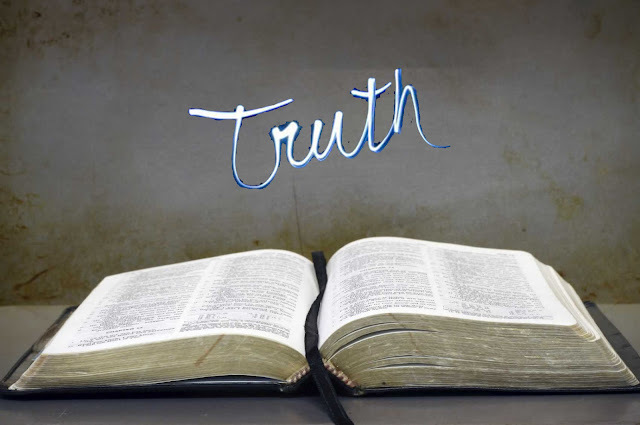 Will Christianity eventually collapse under the alleged weight of evidence against the inerrancy of Scripture, or will the skeptics have to eat crow when the Bible is proven to be without error and truly "God-breathed" through and through? To those who deny the full verbal inspiration of the Scriptures and are still waiting for a blissful future without the LORD of the God-breathed Bible, may every faithful Christian respond, "Don't hold your breath!" The effort to explain away the Bible's witness to its plenary inspiration reminds one of a man standing safely in his laboratory and elaborately expounding—possibly by the aid of diagrams and mathematical formulae—how every stone in an avalanche has a defined pathway and may easily be dodged by one of some presence of mind. We may fancy such an elaborate trifler's triumph as he would analyze the avalanche into its constituent stones, and demonstrate of stone after stone that its pathway is definite, limited, and may easily be avoided. But avalanches, unfortunately, do not come upon us, stone by stone, one at a time, courteously leaving us opportunity to withdraw from the pathway of each in turn: but all at once, in a roaring mass of destruction..." (pg. 119-20). ...these texts of ours [Holy Scripture], again, unfortunately do not come upon us in this artificial isolation; neither are they few in number. There are scores, hundreds, of them: and they come bursting upon us in one solid mass...Let us, however, but open our eyes to the variety and pervasiveness of the New Testament witness to its high estimate of Scripture, and we shall no longer wonder that modern scholarship finds itself compelled to allow that the Christian church has read her records correctly, and that the church-doctrine of inspiration is simply a transcript of the biblical doctrine; nor shall we any longer wonder that the church, receiving these Scriptures as her authoritative teacher of doctrine, adopted in the very beginnings of her life, the doctrine of plenary inspiration, and has held it with a tenacity that knows no wavering, until the present hour" (pg. 120, bracketed explanation and emphasis mine). Every generation of the Church, from 1st-century conception right up to our present day, has had a counter-attack of some kind. For example, we discover the manifestations of unseen evil powers in our own realm through the writings of the apostles and subsequent generations of church leaders. Thus, Warfield and others of his tribe were truly courageous during a time when the Church was being threatened from within by a monumental assault on the inspiration and authority of the Bible: a doctrine that Warfield called an "indispensable safeguard of a sure word of God" (Inspiration and Authority, pg. 124). The ramifications of this attack have been deep and severe, and we see in our own generation what a post-Christian society breeds after it has dispensed with "outdated doctrines" and redefined biblical terms in order to justify sin and rebellion. All of this should come as no surprise to those well-versed in Scripture. We were warned about the wolves in sheep's clothing, the cunning schemes of a depraved mind, and the empty philosophies that undermine the authority of Christ—the Word of God (Acts 20:29-31; Eph. 4:14; Col. 2:8). Clearing the Air by Defining "Inspiration"
Evil people and impostors will become worse, deceiving and being deceived" (2 Tim. 3:13, HCSB). You, however, continue in the things you have learned and become convinced of, knowing from whom you have learned them, and that from childhood you have known the sacred writings which are able to give you the wisdom that leads to salvation through faith which is in Christ Jesus" (2 Tim. 3:14-15, NASB). All Scripture is breathed out by God and profitable for teaching, for reproof, for correction, and for training in righteousness" (2 Tim. 3:16, ESV). At last, here it is: 2 Timothy 3:16. We now arrive at our chief text from which we derive the theological term "inspiration." Lest there be any confusion, or "breathing room," for the skeptic to justify human error in the words of Scripture, we need to dig a little deeper into this term "inspiration" and see specifically how the Greek term theopneustos [lit. "God-breathed"] should be understood in this crucial text. The English theological term "inspiration" is thoroughly entrenched in our circles and has its usefulness, so there is no sense in trying to upend it now. However, it is a bit of a misleading translation of the Greek word, because it lacks precision. Now some folks may think this is quibbling, but if you are a careful student of the Word, then this will sharpen your understanding of what Paul is conveying by his use of the term theopneustos (c.f. 2 Tim. 2:15). Working backward from the English, we can trace the term "inspiration," back to the Latin Vulgate translation of the Greek, and Jerome renders theopneustos as divinitus inspirata. The Greek term has, however, nothing to say of inspiring or of inspiration: it speaks only of a 'spiring' or 'spiration.' What it says of Scripture is, not that it is 'breathed into by God' or is the product of the Divine 'inbreathing' into its human authors, but that it is breathed out by God, 'God-breathed,' the product of the creative breath of God. In a word, what is declared by this fundamental passage is simply that the Scriptures are a Divine product, without any indication of how God has operated in producing them" (Inspiration and Authority, pg. 133, emphasis mine). So, technically speaking, if you are going to use the Latin-English vernacular, the theological term "inspiration" should really be a "spiration." But since we don't speak of "spirations" too often and might get a deer-in-the-headlights look at church if we say the Bible is "a spiration of God," the transliteration "God-breathed" is more accurate and perfectly acceptable (hence, the explanation behind some of the English versions such as the ESV, NIV, YLT, etc.). This narrowed definition should clear up the confusion for us modern English speakers, whose concept of inspiration is something akin to "a motivational burst of creative energy." Were the prophets and apostles merely helped by God, a little here and a little there, to produce the Scriptures? Should we understand inspiration to be another version of "God helps the prophets who help themselves?" The biblical answer is an emphatic, "No!" This term [inspiration] is not a Biblical term and its etymological implications are not perfectly accordant with the Biblical conception of the modes of the Divine operation in giving the Scriptures. The Biblical writers do not conceive of the Scriptures as a human product breathed into by the Divine Spirit, and thus heightened in its qualities or endowed with new qualities; but as a Divine product produced through the instrumentality of men" (Inspiration and Authority, pg. 153, bracketed explanation and emphasis mine). The Scriptural conception of the relation of the Divine Spirit to the human authors in the production of Scripture is better expressed by the figure of 'bearing' [c.f. 2 Pet. 1:21] than by the figure of 'inbreathing'; and when our Biblical writers speak of the action of the Spirit of God in this relation as a breathing [spiration], they represent it as a 'breathing out' of the Scriptures by the Spirit, and not a 'breathing into' the Scriptures by Him" (Inspiration and Authority, pg. 154, bracketed explanation and emphasis mine). In other words, my brothers and sisters in Christ, there is no breathing room for human error when it comes to the Scriptures. God was in total control of the process, and what we have received from the prophets and apostles is exactly what God intends for us to hear. Consequently, a correct understanding of the biblical doctrine of inspiration naturally results in a Word of God that is thoroughly authoritative and "God-breathed;" every "jot and tittle" (Matt. 5:18, KJV) is therefore trustworthy and profitable for our growth and maturity in the Lord Jesus Christ. No matter how well you explain and defend the inspiration and inerrancy of Scripture, there will always be those who stumble over the fact that we do not possess the original manuscripts, a.k.a. the autographa. The reason the original text cannot err is that it was breathed out by God, and God cannot err. The copies, while demonstrated to have been providentially preserved from substantial error, are not breathed out by God. Hence, there can be errors in the copies. To demonstrate, all human beings are imperfect copies of Adam, who was directly created by God. Nonetheless, as imperfect a copy as we may be, we are still 100 percent human. Adam was no more human than we are, yet there is a significant difference between Adam as he came fresh from the hand of the Creator, with absolutely no imperfections, and the imperfect copies of the original Adam that we are. We can no more conceive of God's breathing out an imperfect original text than we can of His breathing the breath of life into an imperfect Adam. What comes directly from the hand (or mouth) of the Creator must be perfect, and only later copies of it can be imperfect. To claim errors in the original Adam or Bible is to allege that there are flaws in the very nature of God" (selected from Geisler's, Systematic Theology, Vol. 1, Introduction, Bible, pg. 499-512, emphasis mine). Geisler is spot-on here and and his reasoning jives with Warfield's exposition of the narrowed, biblical definition of inspiration. The apostles Paul and Peter, physical descendants of Israel and inheritors of a Bible that consisted of extant copies (Rom. 3:2), had no issue grasping the concept of a fully God-breathed, authoritative Bible, and neither should we. An immediate and direct creation of God is always produced without impurity or error, and the words of Scripture are no exception. Also, God's direct creation is described as being brought forth by means of His mouth or breath, which is a concept evident from the beginning (Gen. 1:3; 2:7) and seen throughout the rest of the Bible (c.f. Job 33:4; Matt. 4:4; Jn. 20:22). Thus, Paul's defense in 2 Tim. 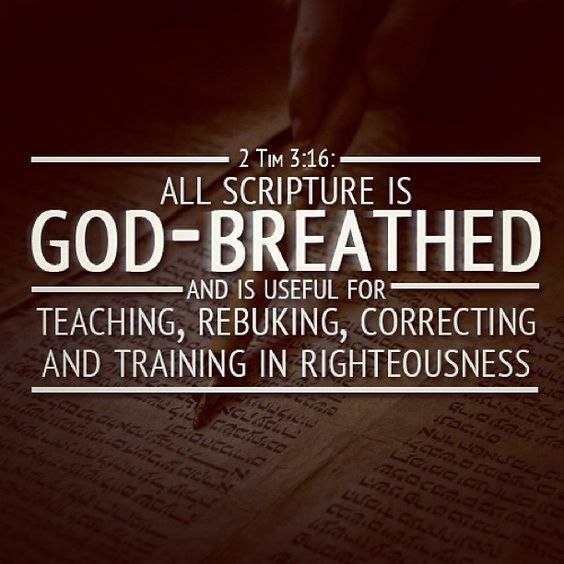 3:16 is as legitimate for us today as it was for Timothy back then—all Scripture, or every book in the accepted and received canon of the Bible, is breathed-out by God and completely reliable. So, dear friends, hopefully this little study has "inspired" you and strengthened your faith in the inerrant, infallible Scriptures. The Holy Bible is given to us by the "spiration" of God [i.e. it's a God-breathed product] without error or the possibility of "expiration." Hallelujah! The grass withers, the flower fades, but the word of our God will stand forever" (Isa. 40:8, ESV). Jeff- Absolutely correct!...just as the Bibles origin is also. When I come across a certain scripture that doesn't "fit", I REALIZE that it doesn't fit because my understanding of it, or its context is what does not fit....and if I tenaciously search in the Bible, I almost always eventually find the Bible explains with other confirming scriptures. This constantly builds my faith. Just the other day I was mulling over a scripture that I just hadn't been able to fit in...it had bugged me for months. I KNEW it was correct, but just had to be patient until my brain worked it out. Finally I had an "epiphany" moment, and found how the scripture did indeed fit, and its proof was witnessed by other scriptures. These little victories for myself are huge for me, as they confirm how true the Bible is. I really in a strange way enjoy not understanding how certain scriptures seemingly can't be correct, because I KNOW they are correct, and when I eventually connect that scripture correctly where it does fit...my faith gets even stronger. The Bible simply is the best book ever written as it is the breath of God. Thank you Jeff for an excellent article. I wholeheartedly agree. Seeing how all the books of the Bible connect to the whole enriches and strengthens our faith. Thank you, Stan! Hi Stan, you were never banned. Sorry, I should have explained further. Sometimes comments are automatically sent for review (we don't control which ones). Your comment had to be approved, which I just did. We do have a few banned users though (including some solicitors and a troll Howard Ratcliffe who goes by "Marianne"). Those comments get auto-deleted after awhile, but if you saw a banned comment it was not yours. Hi Jeff, I wanted to point out that you have the word 'excepted' instead of the word 'accepted' in the paragraph with 2 Tim 3:16 in it. Sorry, I had deleted but I had a typo. Thanks for the heads up, Cathi. Very big difference there between "accepted" and "excepted." Lol. Maybe I should put a disclaimer at the bottom: This article on the "God-breathed" Scriptures is not itself breathed out by God and could be subject to errors and typos. Just fixed it for Jeff. Fantastic defense of the truth of God's Word. Thank you Jeff! Gary- Sorry for my confusion. I saw my post up..and I was the first to comment, them logged in several hours later and saw only the banned in red post. Beautiful truth. Christ cane to testify to the truth. Truth sets free. Lack of truth and lies bring death. This is precisely why atheists and other species of critics will go to such lengths to stop you from using Scripture in any argument. They hit you with the attitude that if you must "resort" to quoting the Bible, you're an idiot with inherently weak arguments. They want you to fight flesh with flesh, and the world will win that one every time. A believer who abandons God's Word is like a soldier in battle who tosses aside his sword--he is a fool who is inviting quick and decisive defeat at the hands of the enemy. Great analogy of a believer who abandons God's word. Thanks for the clarification Jeff. Intuitively I kind of knew that humans could not ultimately corrupt God's word but I didn't understand how to explain it! Awesome. Thank you, Michael. That was a primary motivation for putting this together—to help others explain the doctrine of inspiration accurately and faithfully. Great points, Annabel. Stay strong, and stay blessed while we hold fast to what we've learned from the Lord. Maranatha! Thanks, Sherry. I remember what it was like trying to find my own way before I had faith in the Scriptures. After I surrendered my life to Christ, the Bible has truly been a compass that has kept me on track with God's plan.